• Process: Automatic setting box up--filling--printing-1st sealing-photoelectric sensor adjusting sealing position-2nd sealing--cutting-output in a line. • Speed adjustable by Inverter, LED displays operating indications. • All functions display on intelligent operating panel, easy to operate. • Independent temperature control unit automatically adjust sealing temperature. • With 2-step sealing ensure the sealing effect. • Automatic adjusting sealing position with photoelectric sensor. • Stainless steel and Aluminum alloy construction. • Automatic adjusting film in center line and braking for the film roller, easy forreplacement. • Automatic suction feeding, accurate metering, no bubbling, no leaking. • Automatic discharging in row. 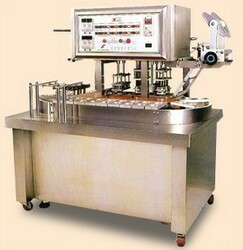 Description • Quantitative filler: Automatic box dispenser. • Printer: heating carbon band type printer. • First sealing unit: Plane sealing. • Photoelectric sensor for film sealing correction. • Second sealing unit: indention sealing. • Cutting device: Cutting film after sealing. • Sealing method：heat press sealing.